Due to the events that took place during the Winsome Purrs disaster and the sense of betrayal held by many of those closest to that situation, Mark Carren took his new family and left the life of political intrigue. Instead, Mark returned to three championship seasons in the world of international lacrosse. Following the third World Championship season with Team USA, United States President, Evelyn Miles requests Mark's return to Washington, DC. The President asks Mark to serve as her Commissioner of Feline Affairs. After a heartfelt discussion with his family, the Carren's choose to return to office. During his time in office, Mark works to convince both anti-Feline and pro-Feline groups to attend and participate in an International Feline Congress despite all of the devastation left behind in the Winsome Purrs disaster. Will the conference take place and what else happens to rock the Feline world??? 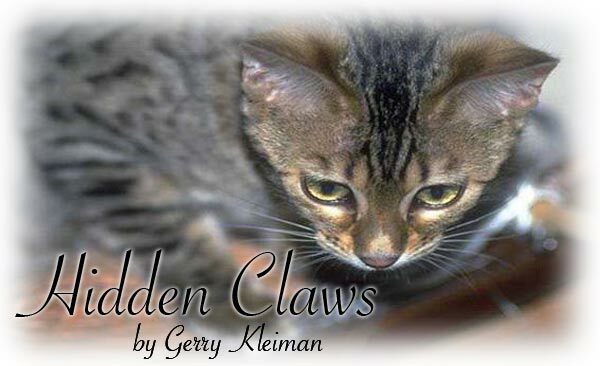 Find out when "Hidden Claws" are "Unsheathed". Hidden Claws is a political satire that creates a world where there are cats who talk and people who respond to their words. Hidden Claws is a novel which combines speculative fiction with political satire and fantasy. Have you ever wondered what it would be like if cats could talk? What would it be like to have verbal communication with them? How would people respond to them? What would our government do about this vocal constituency? No one really knew exactly when it had all started. However, it is widely recognized that cats started talking sometime during 1986. At first, it was only a small number of domestic American cats who spoke a few words or short phrases, and they were seen as freaks. But, their numbers grew quickly. In time, adult cats, elder cats, and even kittens were talking. By the end of 1989, Feline speech reached epidemic proportion. While no clear cause has ever been established, many believe that the ability of American cats to speak was the direct result of exposure to television and advertising, combined with recently documented changes in the length and number of Feline genes. By late in the 20th century, Feline speech would evolve far beyond a word here and there, or even a few phrases. Cats started regularly expressing thoughts and ideas in complete sentences. In the early stages of Feline speech, humans treated "cat talk" as "cute". For a time, talking Feline pets were a pleasant addition to any home. But, very soon, speaking cats were seen as an uncomfortable threat to the human race. The next hundred years would see tremendous peaks and valleys develop in the status of the Feline cause. By the beginning of 2086, the Feline movement had been formed, reformed, and torn apart several times. However, none of these trends had any lasting effect on the overall well being of the cat population. If anything, Feline causes were losing ground at an increasing rate, with a corresponding upsurge of Feline protests and violence. Into this imbroglio steps Mark Carren, the newly appointed Staff Director of the U.S. Senate's Select Committee on Feline Affairs. Our hero is charged by a U.S. Senator to investigate illegal activities involving federally funded Feline programs. Mark and his investigative team, both human and Feline, are on the hunt for Hidden Claws. Direct questions and comments to bear503@live.com.